Some say that private law ought to correct wrongs or to protect rights. Others say that private law ought to maximise social welfare or to minimise social cost. 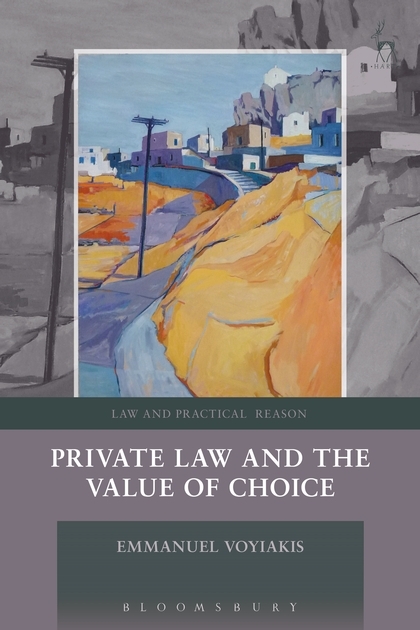 In this book, Emmanuel Voyiakis claims that private law ought to make our responsibilities to others depend on the opportunities we have to affect how things will go for us. Drawing on the work of HLA Hart and TM Scanlon, he argues that private law principles that require us to bear certain practical burdens in our relations with others are justified as long as those principles provide us with certain opportunities to choose what will happen to us, and having those opportunities is something we have reason to value. The book contrasts this 'value-of-choice' account with its wrong- and social cost-based rivals, and applies it to familiar problems of contract and tort law, including whether liability should be negligence-based or stricter; whether insurance should matter in the allocation of the burden of repair; how far private law should make allowance for persons of limited capacities; when a contract term counts as 'unconscionable' or 'unfair'; and when tort law should hold a person vicariously liable for another's mistakes. Emmanuel Voyiakis is an associate professor at the LSE Law Department.